Part of the beauty of The Witcher 3: Wild Hunt is that you can be whatever version of Geralt of Rivia you want to be. I can be a dutiful witcher, hunting monsters and studying my Bestiary from the hunts I took on from town bulletin boards. I can chase after my lost love Yennefer and my surrogate daughter Ciri, ignoring other responsibilities. Or, I can spend hours becoming a masterful Gwent player, scurrying across all of Velen, challenging its greatest players to matches in pursuit of powerful cards to add to my deck. In the 100-or-so hours I spent in The Witcher 3, I wouldn't be surprised if a solid dozen or so were spent losing and winning at Gwent, its internal magical card game. I love Gwent like no other minigame buried in an RPG before it, aside from maybe the time-guzzling casino in the recent Dragon Quest XI. (Damn that casino, and the hours it's since sapped away from me.) Today, CD Projekt Red has officially released the free-to-play, standalone Gwent: The Witcher Card Game, and it's come a long way from its days as a fine but not spectacular beta for a spin-off digital card game. Also out today is a spin-off of the spin-off: the Gwent-driven RPG, Thronebreaker: The Witcher Tales. In Thronebreaker, you don't take on the role of Geralt again. Instead, you are Meve, Queen of Lyria and Rivia. Characters are cel-shaded, a far cry away from the realistic graphics of The Witcher 3. It has the most in common with traditional PC RPGs; but I'm finding its relatively easy-going nature is reminding me the most of Oregon Trail. As in that game we all played in our school's computer labs, I'm making decisions based on the money and resources I have, from how I should negotiate with an NPC to how to move a log out of the way. It's taking me back to the choice and consequence of Oregon Trail, like making the tough decision of whether to wade through a river and risk my wagon tipping over, or shell out the little money I have to ferry across. 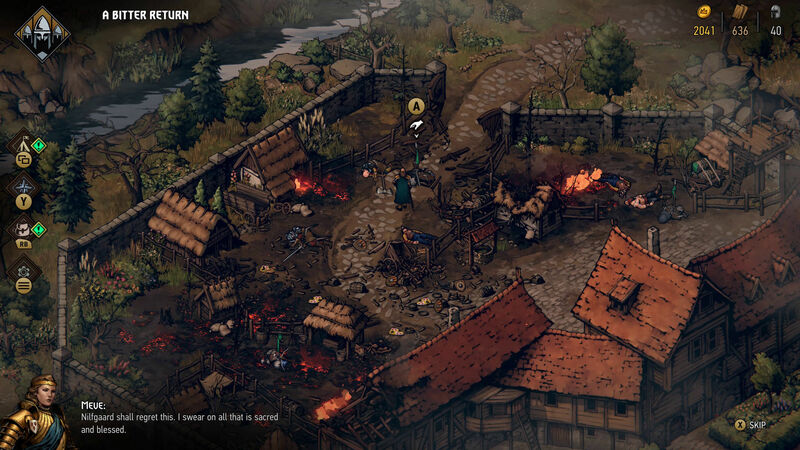 In Thronebreaker, your time is spent running around its overworld, solving problems through dialogue (often accentuated with the note of choosing one of "two evils"), managing resources and your army, and in between all that, dealing out cards. This is where Gwent comes in. 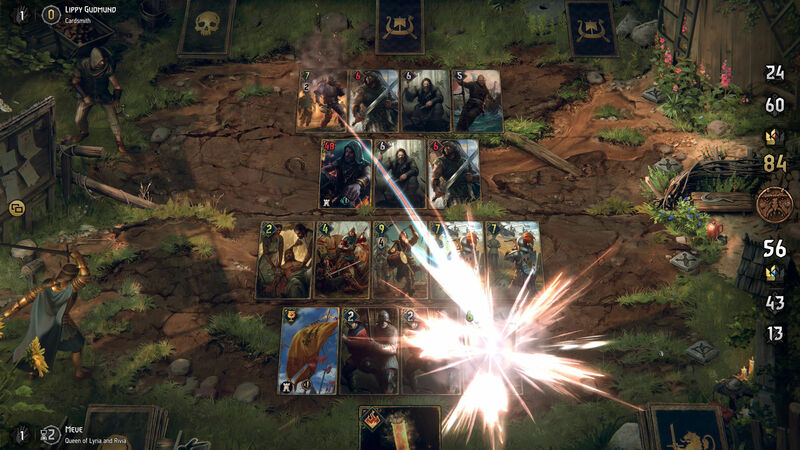 Gwent's been redesigned for both Thronebreaker and Gwent: The Witcher Card Game proper's own Homecoming update too, much different from the beta long ago that erred too similar to its basis in The Witcher 3. Instead of three rows to lay cards in, now there's just two. Gwent has been streamlined for the campaign, with usually only three cards plucked per round—though there are some where a full suite of cards from your deck come into play, but those matches are usually the ones relegated to a single round rather than best two out of three. This helps speed up matches, as you're bound to flunk a couple times before emerging as a victor (at least on the hardest difficulty for any match). It's a welcome change, since full-fledged Gwent battles might grow tiresome at their usual length at the encounter frequency of an RPG's pace. This streamlining of Gwent works well, making for challenging matches that prompt you to think smarter about which cards you use. Leader abilities, which run on a cooldown and offer bonuses—such as allowing your "loyal" ability cards to attack the other side again, and so on—are also essential. Typical battles don't ever get too comfortable either. For instance, in one early story quest Gwent battle, my foe's most powerful card was a spy card on my side of the board, meaning I had to ensure I surrounded him with my own strong cards at all times to fling attacks at him, even as he skipped around the board. It was a challenging battle, but by its end, I found overcoming it exhilarating. Thronebreaker was smooth sailing for my first hour or so, until I ran into the dreaded "Deranged Cow." This cow was part of a "puzzle" Gwent match, highlighted by a jigsaw piece icon on both the overworld and the grander map. In these puzzle matches, the goal isn't just to accumulate more points than your opponent: it's to solve a puzzle in a very specific way. For this Deranged Cow, who is surrounded by weaker innocent cows, the goal I was set with was to take out the Deranged Cow before it killed one of its de facto shields. But it had a twist: after two rounds, it would kill a cow. That's where it got tricky. For the puzzle Gwent matches, you're typically given a particular set of cards to play. The puzzle portion comes in feeling out how to solve the conundrum. There's only one solution; just one correct way to play the order of your cards and Leader abilities, relying on cooldowns and clever thinking. Going into Thronebreaker, I expected normal ol' Gwent matches, not these puzzle encounters that rattled my brain. It took me a solid 45 minutes, according to glancing at my phone and sighing, to overcome the Deranged Cow and save the other cattle. But it was a satisfying feeling. These sorts of mundane circumstances become the norm in Thronebreaker. Sometimes, puzzles come in the form of taking out some nasty Necrophages in a timely fashion; other times, it's things like saving some cows. Thronebreaker carries on the best bits of The Witcher series' spirit: the mesh of fantasy intrigue and drama with the slice of life that has sustained the series' rich world. While you're not riding Roach across the country, you're still trotting across a page of it that feels straight out of a fantasy novel. I don't imagine I'll be able to find the time to wrap up Thronebreaker any time soon. I tried it out on both the hardest difficulty, stupidly considering myself a Gwent master in my The Witcher 3 and early Gwent beta days, and its normal mode. I found myself preferring the normal difficulty's pace, even if it did feel a bit too easy at times (aside from those dastardly puzzles). I didn't expect much from Thronebreaker though, to be perfectly honest. It sidesteps what I expected the spin-off of the card game to be, as it's not a glorified tutorial of any sort. Instead, it's strong enough to stand on its own. We may never get The Witcher 4, but Thronebreaker is a great excuse to live in CD Projekt Red's rendered world for a little longer. Tagged with Analyses,	CD Projekt Red,	GOG.com,	PC.